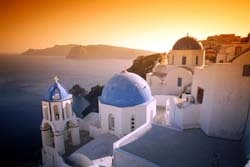 The presented room availability, rates and discounts are actual and final for all our 648 hotels in Santorini. Tourists being not limited in time and wishing to enliven and diverse their leisure should necessarily pay a visit to the city of Rethymno. One may reach the city by ferry. In this case the trip will take about 4 hours. Another way to reach the city is by a high speed powerboat which will get to the destination three times faster. The hottest months of the year on the Santorini island are considered to be July and August. An average day temperature commonly reaches +35C. The heat of the tourist season falls within a period from the beginning of May till the beginning of October. The island features a well developed system of bus service. The island can be easily cruised by bus from early morning till late night. Tourist information offices as well as bus stations provide information on the cost of trips and current bus routes. The guests of the island have also a chance to rent a car. The car will be a necessary means of transportation for those travelers looking for visiting of remote areas of the resort. The best car rental center is located in the airport of the Thira city as in this case the rental cost will be the lowest. Apart from numerous hotels the island offers many of apartments and luxurious private villas for rent. As a rule these are located in close vicinity to the coastal area and thus equal to local fashionable hotels.